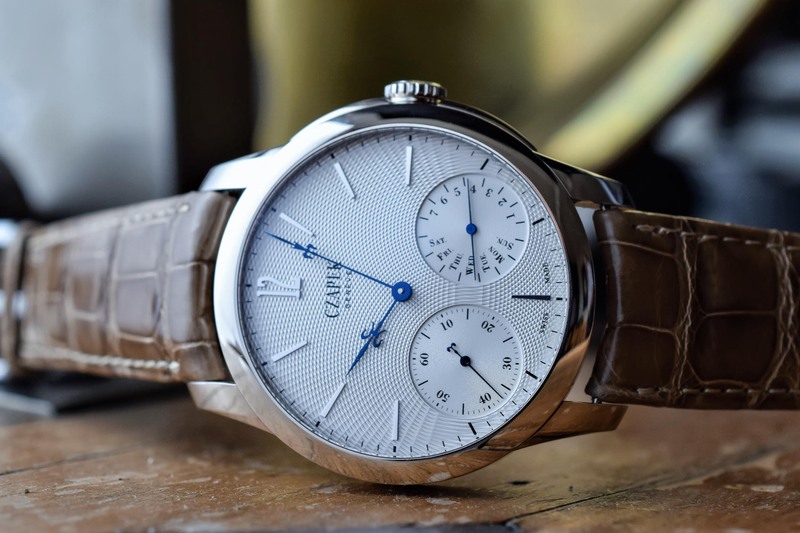 A few months ago, we introduced to you a new brand, with a very known name: Czapek, and their first collection of watches, the Quai des Bergues. 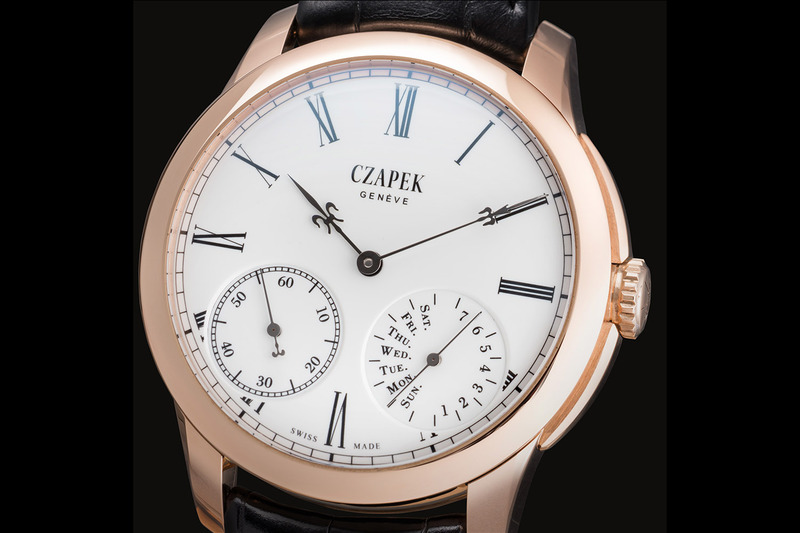 For those who have a bit of knowledge in history of watchmaking, Czapek should resonate in their brains – and for those who don’t know, François Czapek was the co-founder of Patek (with Anthony Patek). Behind the resurrection of this name hides a very interesting watch, with proprietary Haute Horlogerie movement and highly elegant design. Nothing extremely original you’d say… In fact, there’s something a bit out of the range, in the way these watches will be offered, something that mixes historical roots of the watchmaking industry with modern technology: a subscription campaign, but online. 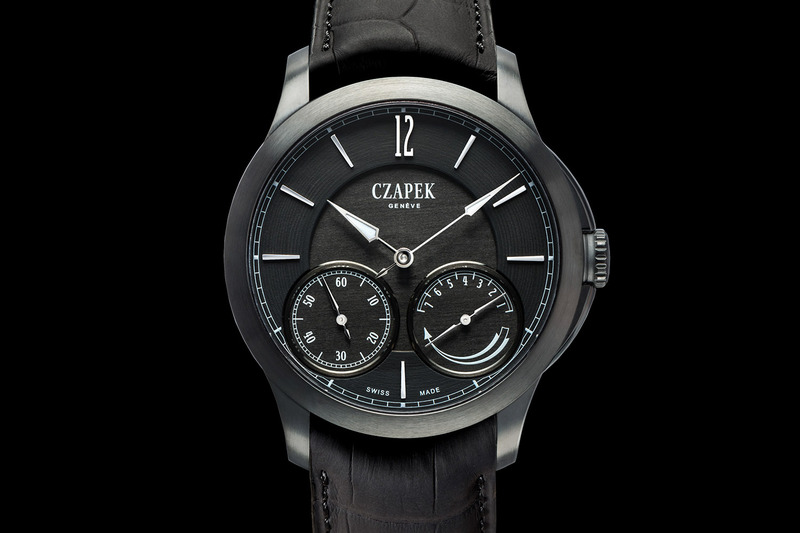 First, at Baselworld 2016, the range of watches offered by Czapek evolved. The Quai des Bergues was offered in several editions already – steel, titanium, rose gold, white gold, with black dial, white dial, enamel dial and with several options for the hands. The goal of that remains of course exclusivity, with the ability for future owners to have a unique watch, at least in the details. The base of the watch remains of course the same, with a nice proprietary movement, developed by Chronode (Jean-François Mojon) – double barrel, 7-day power reserve, high-end finishing… More details about the Czapek Quai des Bergues in our previous article here. The collection now gains some new features that can be chosen by future owners, like some blackened gold “fleur de lys” hands – before Baselworld 2016, the gold edition could only have blued glaive hands or gold “fleur de lys” hands. In the same idea, the titanium edition, with its much sportier look – and surprisingly, we’re talking about the exact same base, only differing from the gold edition by the material used for the case and the finishing of the dial – can now be selected with a black-coated ADLC case and carbon-like strap (as seen above) – but still with the haute-horlogerie movement. Finally, you’ll have options for the power reserve indicator – choice of English or French for the days (or any language on request) or a simpler gauge look without the days. Another option – and this will be properly unique to each future owner – is the possibility to have a short “secret sentence” directly engraved in the enamel plate of the dial. 33 letters to make you own personal motto visible – but not too visible – on your wrist. An elegant and rather poetical way of distinction. The good thing is that everything (almost) is configurable. 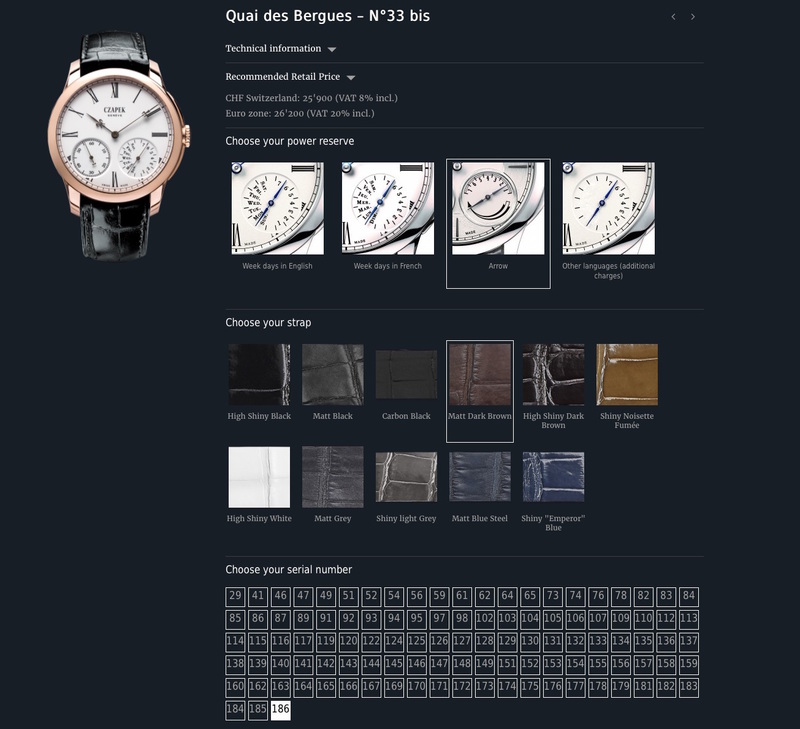 And that’s simply because the Czapek Quai des Bergues relies on a specific way of distribution, something that both pays a tribute to the early days of watchmaking and that uses actual technology: an online subscription campaign. Subscription (or souscription in French) was widely used during the 18th and 19th century, in order for watchmakers to pre-finance production of series of watches. By paying in advance a part of the costs of your watch, watchmakers were able to start the production and to be sure to deliver – and to sell. A famous name, Abraham-Louis Breguet (with his Souscription pocket watches) invented and used this system. 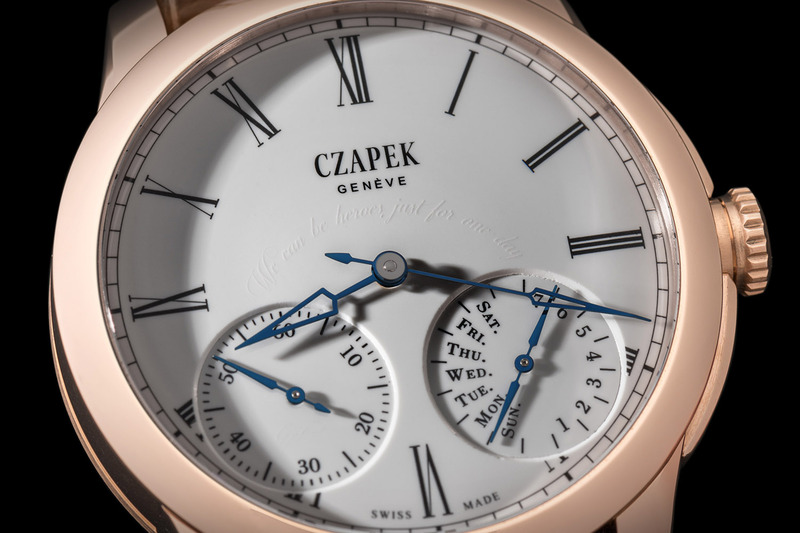 Nowadays, Czapek uses a similar technique for 188 pieces that will be entirely configurable – case material, dial, hands, power reserve indicator, strap, message on the dial, message on the case back and choice of your serial number – everything to create your unique Czapek Quai des Bergues. The 188 timepieces of the “Millesime 2016” Quai des Bergues collection will be made available to subscribers placing an order on the Czapek website or through official dealers. 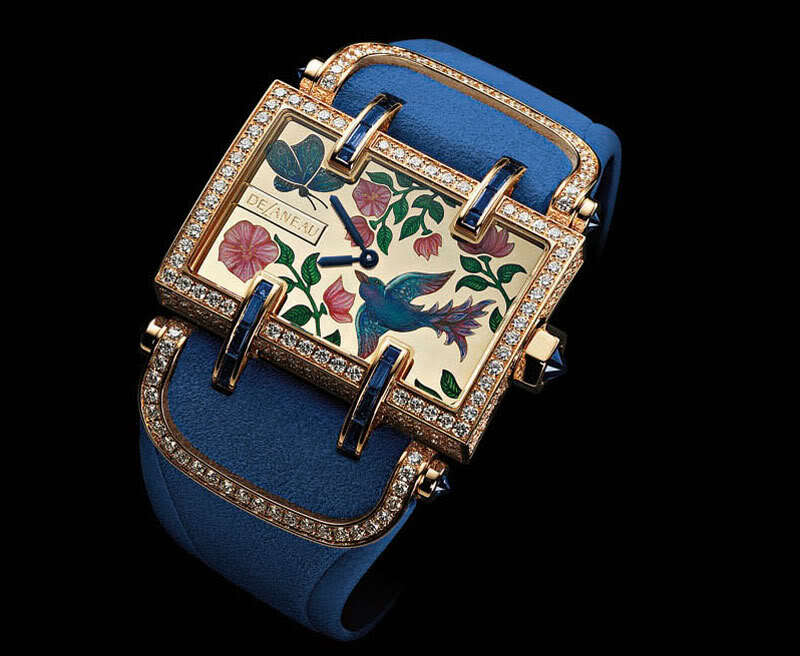 Also note that the brand launched ladies’ versions, with mother of pearl dials and diamonds. 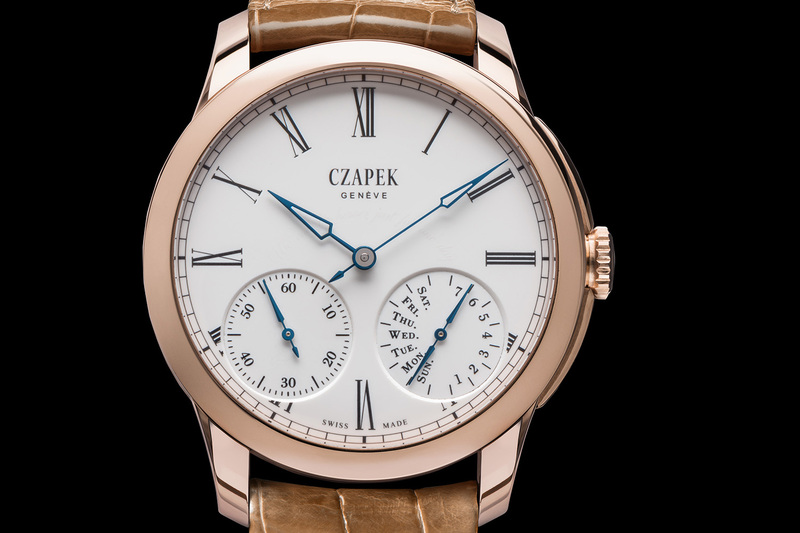 Subscriptions and customizations can be made via your closest retailer – see the list here – or directly via the website of Czapek – see here – where you can directly choose your favorite model and configure it. Be fast, subscriptions end on June 30th, 2016. Prices start at 9,950 Euros for the stainless steel edition, 14,900 Euros for the titanium version and finally 24,150 Euros for the gold editions. 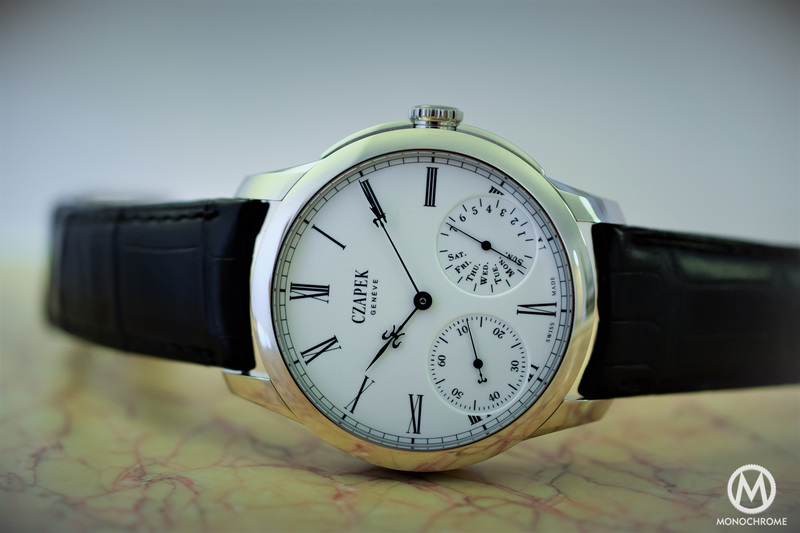 czapek.com. 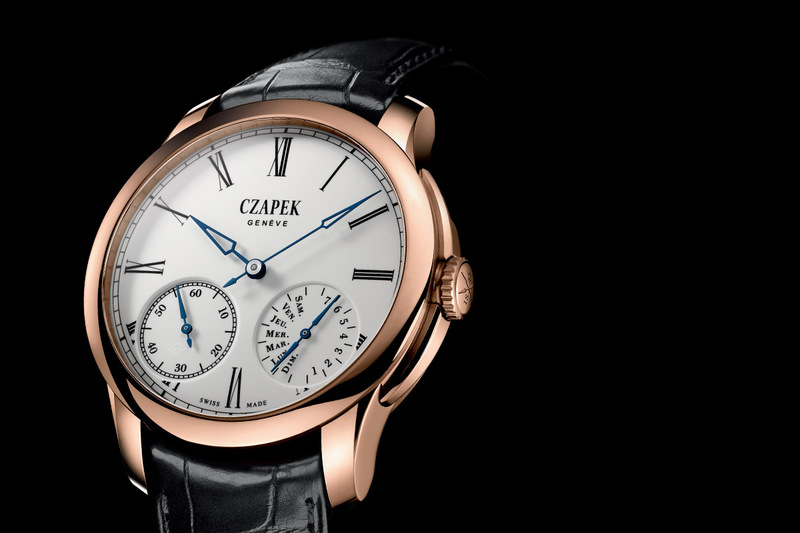 Czapek is just an assembler. All the parts are outsourced! This brand will disappear soon. Thanks for this comment but allow us to make an answer. First of all, be sure that this is not a sponsored post at all. We decided to publish it – and only we… – because we find the brand interesting and the way to offer the watches rather unique. The brand has nothing to do with the article, be sure of that. 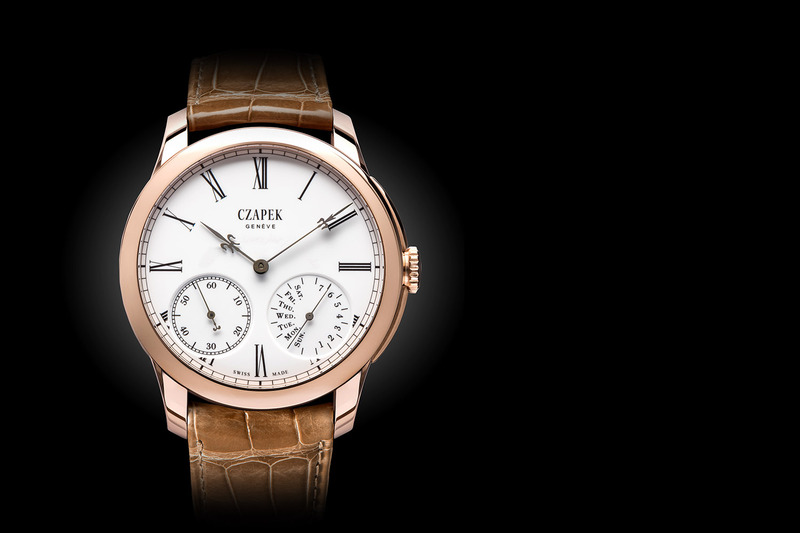 Then, concerning the fact that Czapek is “just an assembler” you’re right – but that’s the case for many small brands. 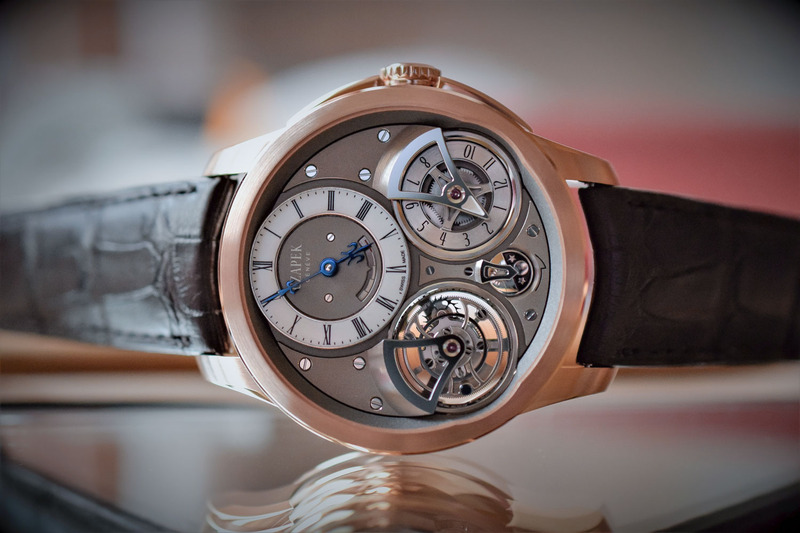 At least they have a dedicated movement, not shared or outsourced from a big name – and Czapek is clear about it. Once again, that’s a rather usual way to do in independent watchmaking. Finally, we don’t wish them to disappear soon. Maybe you don’t like the brand – and we totally accept that of course – but admit that there is room for anyone. Disagree with the first comment. I’ve been following this brand and this is not a sponsored post. Many people are interested in this brand because they have a different model for obtaining capital, and a different model for purchasing their watches. Please continue to send your readers updates on this brand. I for one (if I had the money) would buy this watch in a second. It is unique movement with unique data points on the dial, i.e. small seconds and a day of the week + power reserve. It is historically accurate to the original model and has an enamel dial. I think it is a unique piece and I hope they are successful. I don’t think the price is too much for what you get. We need watches that dare to be different. It would be interesting to see how they navigate the current watch industry, hence keep providing updates. They are those that do, the rest of us just criticize. I wish them all the best and I think how they progress will be interesting. Box say: critties gonna neg. RGM gets the same scorn from similar sacrosanct pundits. Not in my budget, but it is interesting. As easily as the first comment dismisses the brand, I dismiss that comment. Finally we start to see a brand seeking new distribution models, a brand that’s catering towards the buyers and allows personification and selecting components etc, rather than just continuing on old avenues.